Who Was Ever Worried About the Jets in the First Place? By our count, the Jets quarterback has "grown up," "matured" and "had his coming-out party" (always our favorite) five different times now. He began in his very first game, beating Houston in 2009's Week One, and from that peak maturity he has only grown more peak mature. Week 7's 38-0 win over Oakland — which ended a three-game losing streak in which Sanchez had played terribly was Maturation No. 2. Week 17's win over Cincinnati, when Sanchez "learned" his team could win 37-0 even if he only threw for 63 yards was Maturation No. 3. The playoff win over San Diego — sample line: "The Jets are watching quarterback Mark Sanchez grow up before their very eyes" — was Maturation No. 4. 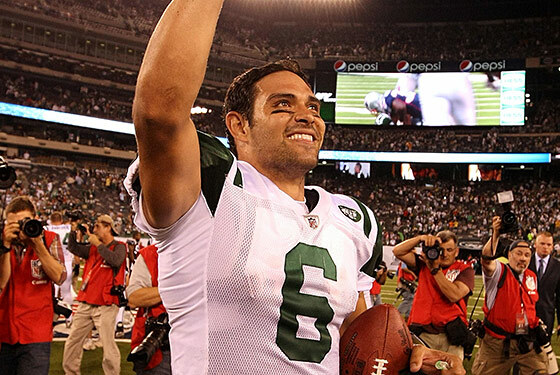 Yesterday, the Jets' convincing 28-14 win over the Patriots, was No. 5, and the biggest, though the most recent one is always the biggest. No. 6 should only be a couple of Jets losses away. Sanchez certainly looked the part of an improving second-year quarterback after halftime yesterday, and much hay is being made of how he outplayed Tom Brady, which is true in the sense that Brady was unfortunate enough to have to face the Jets' defense while Sanchez did not. At Yahoo! Shutdown Corner, the Mighty MJD points out that Sanchez's alternating performances the first two weeks (excellent against the Patriots, terrible against the Ravens) can be accurately compared to Carson Palmer's against the same two teams so far. The Sanchez we saw yesterday is probably not the real Sanchez, and the one we saw against Baltimore last Monday probably isn't, either. He's average so far: He's, all told, about where Carson Palmer is. The Jets can win a lot of games this season with Carson Palmer as their quarterback. The Jets have a lot of questions — though not as many, if you ask us, as the Patriots do; this looks like a team that might be running on fumes by late November — and they'll be watching Darrelle Revis's MRI results on his hamstring with clenched teeth and crossing fingers today. Sanchez is surely going to regress again at some point; every new arbitrary "maturation" point must of course be preceded by some down period. The team still has a rough schedule for the first half of the season. LaDainian Tomlinson, who looked quite terrific at points yesterday, is still a 31-year-old man. All it takes is one loss to turn the bravado back to hubris again. But the Jets surely did save their season yesterday. They might have to do it again. But two straight losses at home, after the off-season they just had, might have been too much for even Rex Ryan to bear. The Jets have their swagger back. Swagger might be a bit too strong a reaction to "disaster avoidance," but it works for them. The front pages of the tabloids were calling the Jets frauds last week, and champions this morning. The team surely wouldn't have it any other way.